Introduction: Mary Harrell-Sesniak is a genealogist, author and editor with a strong technology background. 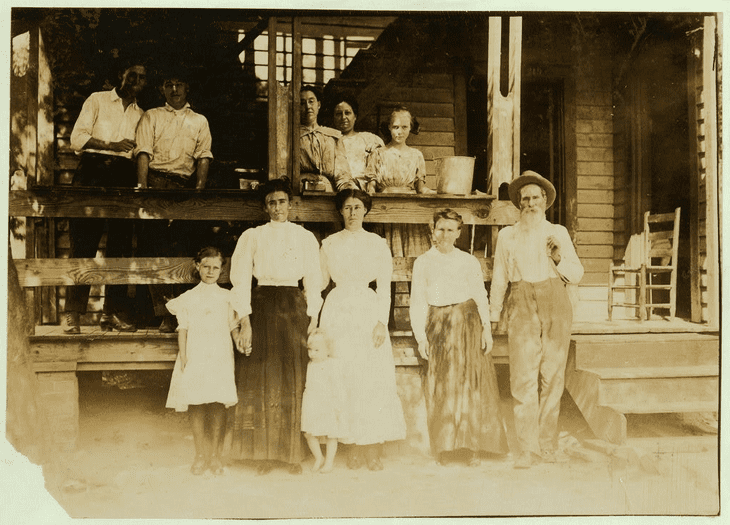 In this guest blog post, to celebrate March being National Women’s History Month, Mary provides practical tips to help you search for your female ancestors. You know that age-old expression, What’s in a name? Well, it means absolutely nothing if you can’t find your female ancestor in any of the records—much less her maiden name. Since the majority of “dead end” ancestor quests are for women, I’d like to share some overlooked avenues for breaking through those genealogy research brick walls, in honor of Women’s History Month. 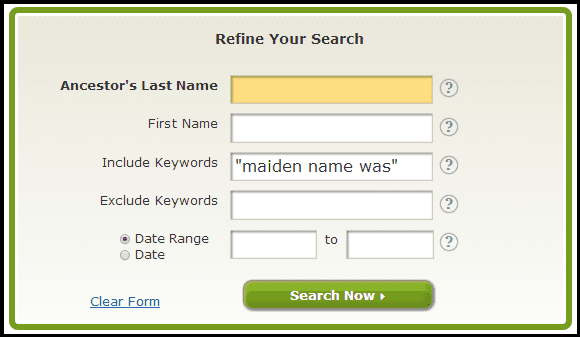 This tip suggests that when searching the women in your family tree, you need to search for every name she ever went by, whether it be a formal first name (given name) or an informal nickname. Most women, including myself, have multiple identities, depending upon the context. Someone might have a pet name within the family, a formal name on a birth record, and might also gain a new name in a religious setting. And a woman might also go by one spelling as a child, and then choose to spell her name differently as an adult. Useful English: Women’s Names and Nicknames http://usefulenglish.ru/vocabulary/womens-names. Behind the Name (http://www.behindthename.com/), a website which examines the etymology and history of first names. Titles aren’t always formal. They can be applied according to the role one takes in the community, and vary from situation to situation. 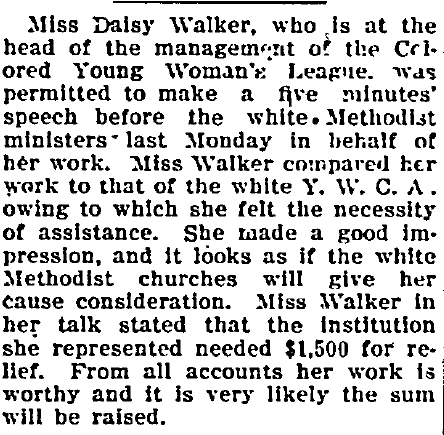 Take, for example, Mary Jane Smith, a popular neighborhood mom in Atlanta. It’s possible some genealogical records only call her Mama Smith, whereas others might name her as Mary Jane Smith. If a woman wished to compete in a man’s world, she typically used a pseudonym. Many people have heard of Louisa May Alcott, who wrote the beloved novel Little Women. However, few know that Louisa used the pseudonym A. M. Barnard to publish a series of “potboilers” that were thrilling Gothic stories. Many assume that men are more prone to be recorded by their initials, but it is common for women also, depending upon the circumstance. 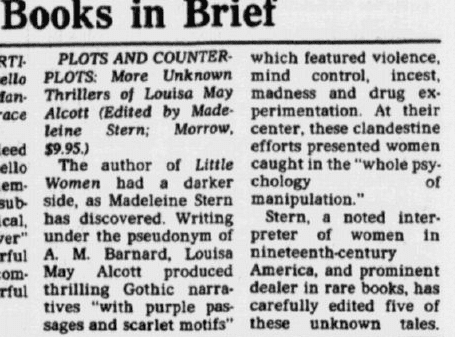 Female authors and artists very often use initials to compete in a man’s world. Mary Jane (Olmstead) Stanton was a suffragette and author who appears in records under the name M. O. Stanton. 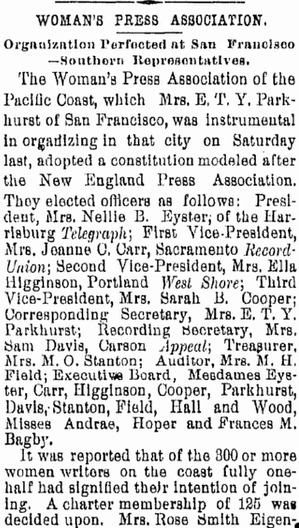 In this 1890 newspaper article, written when Stanton was involved as a founding member of the Woman’s Press Association of the Pacific Coast, some women were referred to by their initials (Mrs. E. T. Y. Parkhurst), others by their own names (Mrs. Sarah B. Cooper), and one by her husband’s name (Mrs. Sam Davis). Official government records, such as patents, are sometimes recorded by the inventor’s initials—so if you search only by the obvious names, you’ll miss them. The Submarine Telescope and Lamp was patented 16 April 1845 by S. P. Mather (Sarah Mather) under U.S. Patent 3995. The invention of the modern form of the rolling pin was patented by C. Deiner (Catherine Deiner) 17 March 1891 under U.S. Patent 448,476. As a country of immigrants, we shouldn’t be surprised that name spellings vary from country to country, or that a bilingual family might interchange names according to the cultural setting. A woman might be called by her Old World name in the family setting, and recorded in other ancestry records by the more common American spelling. For example, an ancestor named Mary might also be known as: Maria if your family came from Spain; from the Netherlands, as Marja or Maaike; and if your female progenitor was Welsh, she might also be recorded in records as Mair. It can take several generations before Old World names are Americanized. American and foreign versions were often interchanged, depending upon the cultural setting. Names are typically recorded differently in English-speaking newspapers than in foreign-language editions. Behind the Name has several country-specific articles, such as this one for Spanish names: www.behindthename.com/names/usage/spanish. There are more ways to prove a marriage than almost any other event—but many sources for marriage evidence are overlooked. Some will not be found on the Web, so think creatively if you haven’t been able to locate a woman’s maiden name or marriage record. When I discovered this last genealogy research tip, it was a real “Aha” moment! Now incorporate those keywords with a name search, and see what you find! 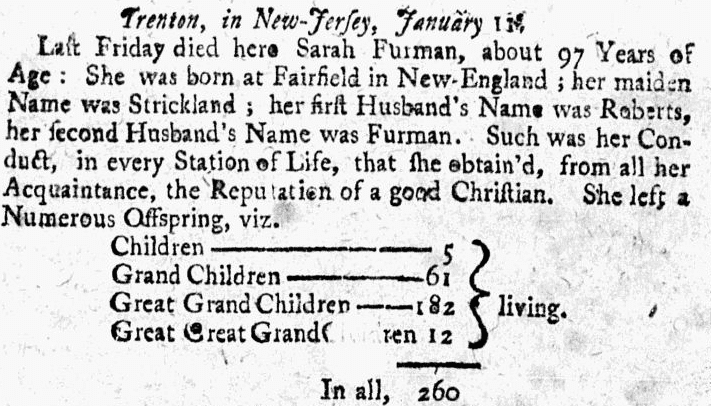 When I entered “Sarah Furman” “maiden name,” this record identifying her as a Strickland appeared—a fantastic research find listing her 260 offspring! Yes, finding all the genealogy records for your female ancestors can be tough, but employing these eight research tips—plus a little patience—might turn up some solid results for you in your family history searches. Please share with us in the comments section any successes you’ve had from using these tips, and any additional methods you’ve used to find the females in your family tree. I am working on my lineage for seven generations, all through the females of the line. It gets especially hard in the early 1800s. Very exciting that you have successfully researched seven generations of your matrilineal ancestry. Not many researchers have achieved the same! This was a wonderful post! Thank you for the fine examples, some of which I would never have thought of. I am certainly saving this one. Thank you for the kind words. Let me know if the tips help you break through any brick walls! Hi very interesting and helpful article. Im not from the US and dont live there. Could somebody explain me if in a certain time women got her maiden names in a differente way than men? Alcott was born on November 29, 1832, in Germantown, which is now part of Philadelphia, Pennsylvania, on her father’s 33rd birthday. She was the daughter of transcendentalist and educator Amos Bronson Alcott and social worker Abby May and the second of four daughters: Anna Bronson Alcott was the eldest; Elizabeth Sewall Alcott and Abigail May Alcott were the two youngest. Why Louisa and Abigail had first the “May” name from their mother and then the Alcott surname as second? How and why families chose to assign middle names was a personal decision. Some children did not receive them, and others were given them for a variety of cultural and religious reasons. In this example from the Alcott family, Bronson, Sewall and May were family surnames (last names) from earlier generations, but are not considered to be surnames for the children. The Alcott family chose to use what is called a naming convention for middle names. Most commonly these were used for first names, but their tradition was to use the maiden names of female predecessors for the middle names of the four sisters. Abigail and Louisa Alcott received their mother’s maiden name of May. Anna Alcott received her paternal grandmother’s middle name of Bronson. Elizabeth Alcott received her maternal grandmother’s maiden name of Sewall. Their father, Amos Bronson Alcott, received his mother’s maiden name of Bronson. His father, Joseph Chatfield Alcott, received his mother’s maiden name of Chatfield. Hi and thanks for the explanation. So this pattern of using the mothers surname or earlier generations family surnames as a second name is very american right? Or was it also present in the U.K. culture and traditions? I knew this pattern in jewish and middle eastern families, where they dont want to loose the memory of an important family name or just to honour that side of the family. Also in old spanish and portuguese registers sometimes you can find very rare examples of this practice. Maybe because in spanish is not typical to find surnames that can be also use as names. Interesting about the spanish registers and other cultural practices. Thanks for sharing. In the U.S., the naming convention of using surnames for middle names is common, but varies from family to family. We also see double first names, as in Mary Ann or Thelma Lu. I have had some success researching the death certificates of the siblings of my ancestors. The names of the parents & their birthplaces are listed & the person reporting the death can also be a clue. Elderly parents sometimes lived with their children or other family members. Family usually lived close. Looking through the census at the neighbors can bring more family to light. Good luck with your research. I have Harrell (Herrell) in my lineage. My maternal grandmother’s maiden name was Herrell. I’m still researching that branch. I have found many Herrells from the Portland, Tennessee area. My 2nd great-grandmother Mary Elizabeth (Aldridge) Herrell went by the name Mollie. Another nickname to try is Polly (Molly). Thank you for sharing the tips about sibling records (esp. death certificates), exploring the relationships of neighbors and the Polly/Mollie nickname of your second great grandmother. All are great ideas. And what fun that we share a Harrell/Herrell surname connection! I suggest that you include enslaved women in the Research Considerations and Marriage Record Research Suggestions. They should be included in Research Considerations: They are difficult to find because slaves weren’t allowed to marry, so most African-Americans got married after the Civil War. However, researchers should check local customs because some slaves did marry (my great-great grandparents were married by a free black minister in KY in 1854 but I don’t believe it was recognized by the state). Free African Americans were allowed to marry the same way others did. You could include Cohabitation Registers and Freedmen’s Bureau Records under the Marriage Record Research Suggestions. They were created at the county level in Southern states after the war so former slaves could legitimize relationships formed during slavery. Also, Freedmen’s Bureau agents performed marriages for U.S Colored Troop soldiers. The only way I confirmed the maiden name of my great-great-great grandmother, who was born in the 1830s and died in 1923, was to find her death certificate. Unfortunately that research tactic can only be used for a limited number of women.